Where are the intellectuals? Where are the thinkers, college professors, poets, artists, writers, journalists, religious leaders? Ph.D. stands for Doctor of Philosophy; Where are the philosophers? Why won't they speak up? Why are they in hiding? The most recent IPCC report painted a stark picture of climate change and even called for a Plan B because governments and politicians are failing to show any will. With 85 richest people having as much wealth as the poorest half of the whole world, income inequality is reaching dangerous levels. More than one in five children live in food insecure households in the wealthiest country in the world... With drone strikes, global surveillance, money in politics and militarization of police forces, the constitution Americans most cherish is being shredded to bits. Yet, it seems like a great majority of "intellectuals" have withdrawn themselves from public life. Maybe they are too busy, like the rest of us, watching the 24/7 CNN coverage of Flight 370? Most "intellectuals" are not intellectuals at all. They lack any moral courage. They can be bought by the highest bidder, for grants and for titles. They are simply careerists, not the philosophers their Ph.D.'s suggest. They are cowards, hiding under the cover of their respective specialties, while willfully shying away from any matter related to the greater good. They are snobby; The problems of the "common people" are beneath them. With their heads buried in the sand - or in their own asses - they are simply oblivious of any danger; Someone else, some other expert will come along and solve problems like climate change or income inequality. If we leave it up to the "intellectuals", "specialists" and the so called "experts", we are doomed. First we'll go through a period of great social injustice, followed by economical, political and social collapse, followed by decisive ecological collapse. The signs are there and are becoming more obvious each day. Astrophysicist and great intellectual Carl Sagan posed the question: "There are not yet any obvious signs of extraterrestrial intelligence and this makes us wonder whether civilizations like ours always rush implacably, headlong, toward self-destruction". The answer is looking more an more like "Yes". 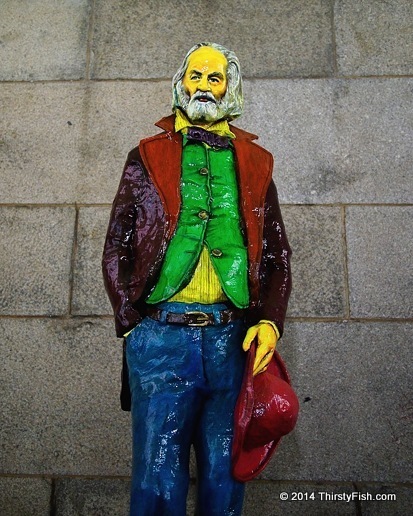 The photographed statue of Walt Whitman was on display in the Manhattan Bridge Archway.